Pet Store Puppies Implicated In Campylobacter Outbreak : Shots - Health News Adorable fuzzy puppies aren't usually thought of as disease vectors. But they come with germs, too. 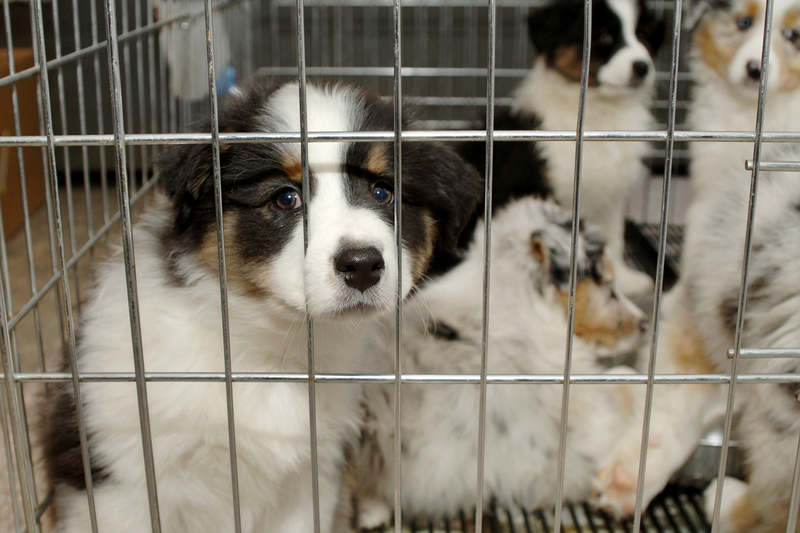 It's not clear how pet store puppies caused dozens of humans to get sick with Campylobacter. Campylobacter infections are common in dogs, cats and people. Twelve of the confirmed cases are in Petland employees, and 27 other people who fell ill either visited a Petland, recently purchased a puppy there, or visited or live in a home with a Petland puppy. According to the CDC's announcement, nine people have been hospitalized and there are no reported deaths. Petland is cooperating with officials in the investigation. In a statement, the company writes, "The CDC has not identified any failures of Petland's operating system that would lead to any Campylobacter infection." The company says that accordance with the CDC's advice, it will continue its efforts to encourage hand-washing after contact with puppies. While the exact cause of this outbreak is not known, there are a few possible reasons the puppies could be sick. Shelley Rankin, an associate professor of microbiology at the University of Pennsylvania's School of Veterinary Medicine, says the biggest risk factor is that they're puppies. Like small children, puppies don't have a strong immune system and can more easily get sick. Rankin says she has seen many outbreak investigations, and it can be difficult to pin down the exact cause. Campylobacter can infect dogs, cats and humans, but most commonly the bacteria are spread through eating raw or undercooked meat. About 47 percent of raw chicken samples tested in 2011 were positive for Campylobacter, according to the CDC. Humans don't typically spread the bacteria to each other, but it is possible to be exposed through dog feces. In a typical case, symptoms last for about a week. Amesh Adalja, a senior associate at the Johns Hopkins Center for Health Security and a member of the Infectious Diseases Society of America Public Health Committee, says that the bacteria are one of the most common causes of gastroenteritis, or stomach flu. For every 100,000 people, 14 cases of Campylobacter infection are diagnosed each year. The CDC estimates that annually, Campylobacter affects 1.3 million people. The good news is that most people get well on their own. The CDC says people typically need antibiotics only if they're immune compromised or at high risk of complications. To minimize risk of illness, the CDC suggests washing your hands after touching your dog, though for any dog lover, washing your hands every time you pet one seems unrealistic. The CDC also recommends quickly disposing of dog poop using disposable gloves, as well as regular visits to the veterinarian to keep your dog healthy.